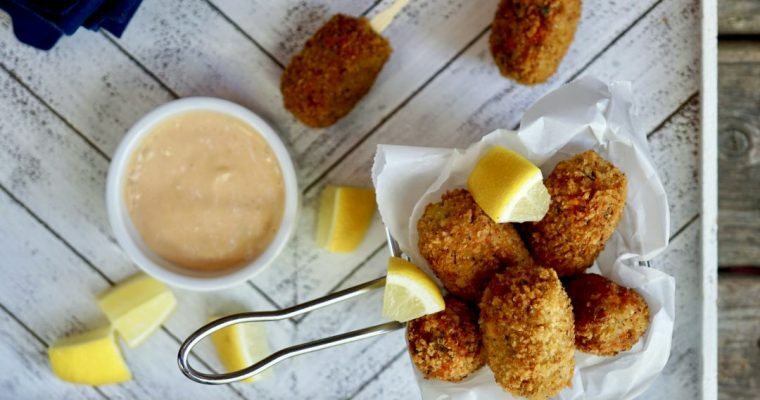 Looking for something different to make? Preparing fish or any other food “en papillote” is simply French for fish “in paper”. It is considered a moist heat cooking method where the food is placed in a folded and sealed pouch and baked in an oven. Most often this is done using parchment paper; but in a pinch, aluminum foil and a small paper lunch bag will work just as well. 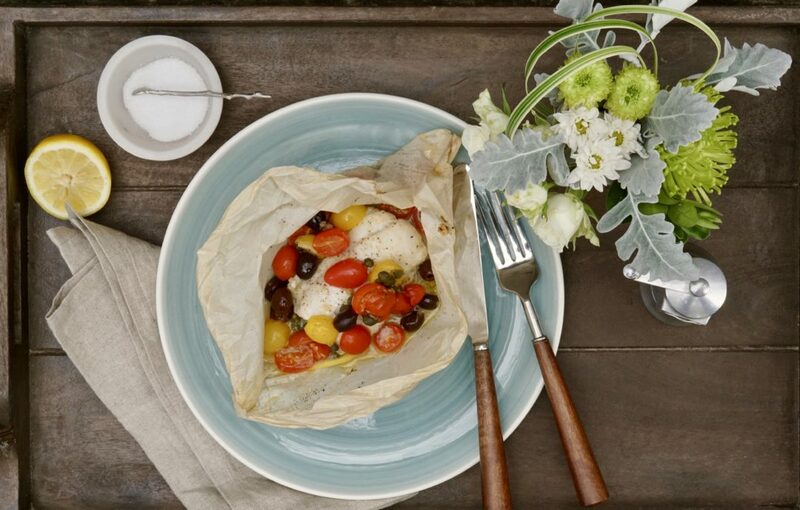 My go-to is parchment, especially when I’m using fish, since parchment paper is non-stick. But you must make sure your ends are sealed nice and tight. The cooking method here is steam. The parchment parcel seals in moisture and steams the food. For dramatic effect, a papillote is traditionally served at the table where it is sliced open with a knife so the aroma can be enjoyed upon releasing the steam. 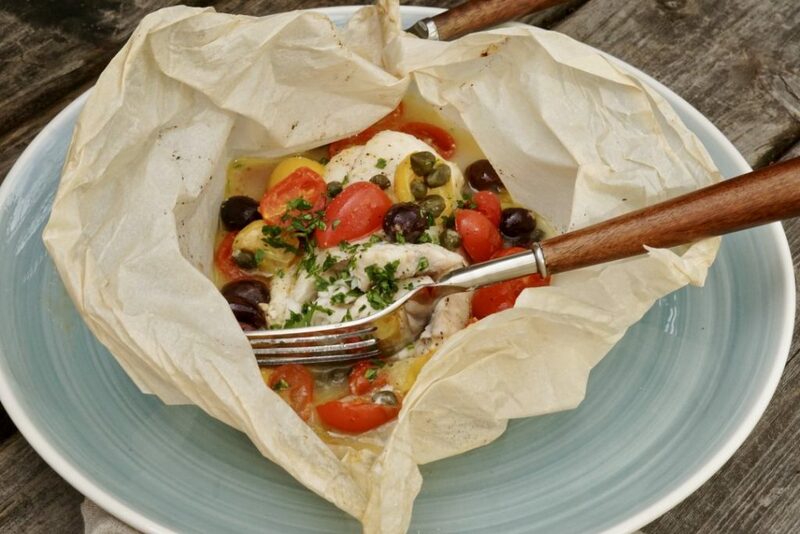 Delicate foods such as fish or vegetables are most often used when cooking en papillote because they can be steamed quickly. Liquid such as wine, stock or water can be added to help enhance flavor. 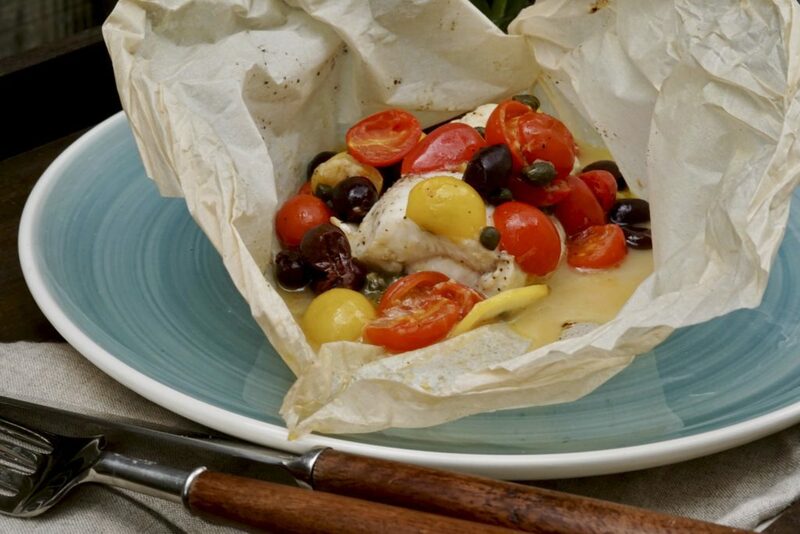 Fish en papillote is a wonderful, easy and healthy way to cook many fish and vegetables. For this recipe I keep it ultra simple by adding beautiful red and yellow grape tomatoes, olives, capers and a touch of citrus. Top with a drizzle of great olive oil, wine and seasoning. It’s that simple. Perfecting the proper fold to throughly seal the papillote is the trick here, but you can easily master it. For more information on making the perfect parchment papillote, check out this link. Because you can’t actually see inside the parchment pouch to gauge if the fish is done, you must rely on the recipe or a bit of trial and error until you get the technique down pat. Once you’ve got that down, there is no stopping you. 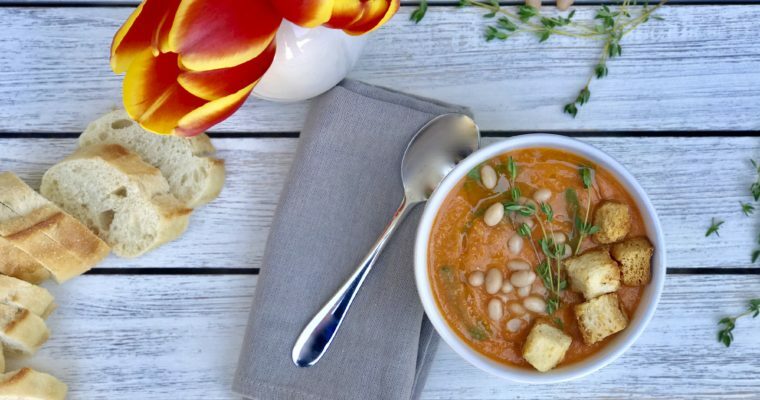 This is a great cooking method all home cooks should learn and one that can truly be used year-round for a quick meal option. 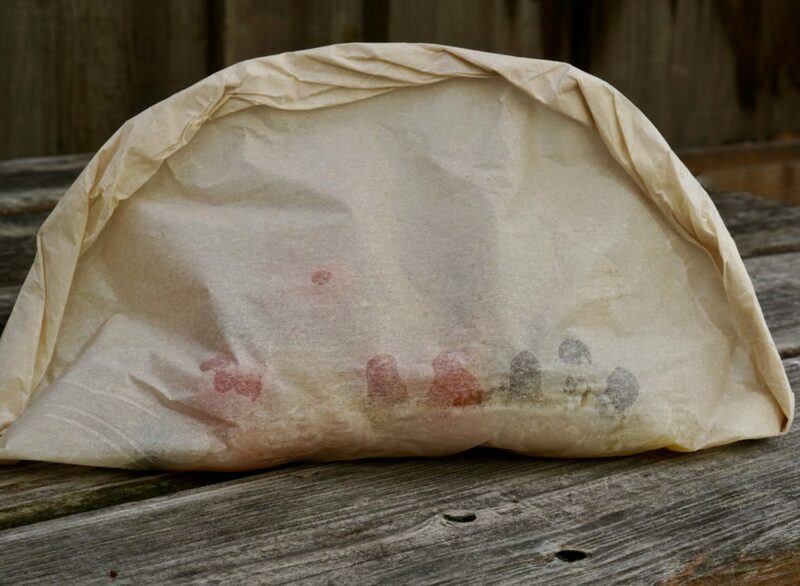 Step 2 To make the papillote pouch:Fold four 14×12 inch-square pieces of parchment in half. Starting at fold of each piece, cut half a large heart shape (beginning and ending your cutting on the crease). Step 3 Season the fish generously with salt and pepper and set aside. Step 5 Place a couple of lemon slices next to the crease on each piece of parchment. Place a piece of fish on top of the lemon slices. Step 6 In a small bowl add the tomatoes, garlic, capers, olives, 1 tablespoon olive oil and a dash of salt and pepper. Step 7 Drizzle the fish with the remaining tablespoon of oil followed by the lemon juice and wine. Step 8 Place about 2 tablespoons of the tomato-caper mixture on top of the fish. Step 9 Next, bring both sides up the parchment paper upwards until the tops meet. Starting at top of each parchment, make small, tight, overlapping folds along outside edge to seal packet from the top down one side. Do the same thing on the second side. Twist both tail ends tightly to seal completely and tuck slightly underneath. Step 10 Place the sealed packets on a baking sheet. Roast for 12-15 minutes depending on the thickness of the fish. Step 11 Carefully transfer the puffed packets to the serving plates. Slit tops with a knife and gently open. Garnish with chopped parsley.